I prefer to write notes on paper, and here&apos;s why. I definitely prefer to write notes on paper. I prefer to write drafts on paper before I put words online as much as possible. I like the feel of pen or pencil on paper. I feel that my thoughts flow better, maybe even more gracefully when I put pen on paper. I do find the ritual of writing by hand to be soothing, a bit more relaxing. Even this prompt, which I am now posting online, was written first on paper. In this case, I jotted down my initial ideas in my personal journal. For me, it’s just the natural thing to do. I first develop and expand my ideas in paper, then I copy them, maybe with some minor editing, onto the online medium. That’s what has worked for me for years. It still works for me today. It is an approach that allows me to reflect and think. And yet paper, as long as some care is taken, can be more permanent and accessible than electronic devices, All it takes is a loss of power, and no more electronic notes. With paper, as long as I have a candle, a working pen or pencil, and paper, I can still write, and I can choose whether to share what I write or not. This idea applies to books as well, but that is another note for another time. I do some pen collecting. 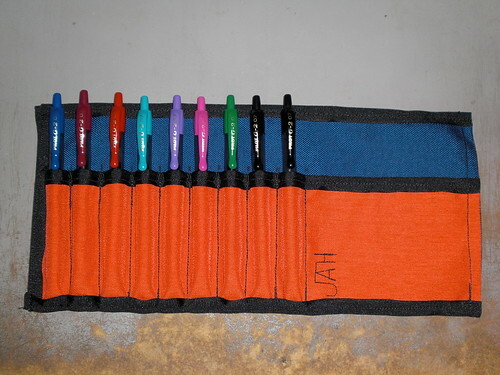 I saw the question–do you collect pens, and how do you collect them–in a blog a while back. I gave it some thought, and I realized that I do collect pens. Now, I do not collect expensive or high end pens. Those are too expensive, and I do have to live on a librarian’s salary. I like pens that work for me. As I think about it, I collect two kinds of pens. I have a few nice pens that I use as my personal pens, signature pens. Then I have pens I use on a daily basis as my work pens. I use my work pens for more extensive writing, such as writing on my personal journal. Now, I may use one of my nice pens to write in my journal, usually when I am not at home, but overall, I use my daily use pens as my basic writing tool. I have gradually built a small collection of the personal/signature pens. I keep those in my jewelry box, and I try to rotate their use. Currently, I am favoring my Waterman Harley Davidsons: one is a fountain pen, and the other one is a roller ball with a nice wolves scene on the barrel. The fountain was a lost and found unclaimed item in one of the libraries I used to work at; it was going to be discarded. I claimed it. It is a bit worn, but with new ink cartridges, it has been working well for me. In fact, I’ve used it to write in my journal a few times. It has become a favorite pen. The roller ball was a present from my better half a while back. I do have some nice ballpoints as well, but I do not use them as much. As for my casual/daily writing, I tend to prefer gel pens or roller balls. Pilot G2’s (like the ones in the photo), ones in different colors, are ones I do like. They have a nice point, thin, the ink is usually smooth, and the color variety is nice too. So, that’s a bit about the pens I collect and use. A hat tip to the Goldspot Pens blog, which gave me the inspiration to write this. It was a nice bit of serendipity that Plinky had a prompt asking about stuff I collect too. Short addition: The link from Goldspot Pens on “How Do You Collect Pens?” Found via this carnival. Plinky is not very good about placing links in replies.